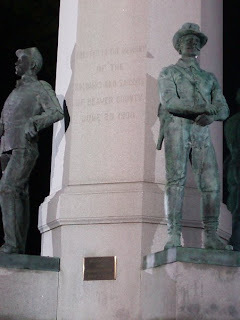 Without soldiers where would we be? 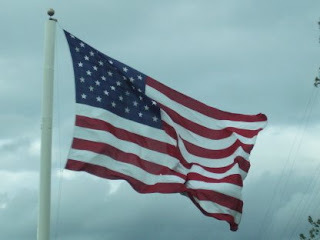 As we celebrate Memorial Day, let us take a moment to give thanks to all the soldiers who have fallen and to say a special prayer to keep those presently serving safe. About a year ago, one of our local papers asked for pictures of veterans to put in a special addition. When we started collecting the pictures, it was amazing just how many of our family had served. In just my immediate family, we have my father, one brother, two cousins, and three uncles. 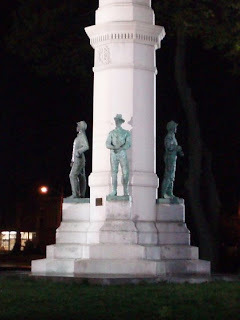 My husband also served in both Korea and Vietnam. This morning my mom and I went to the local nursing home and helped take the residents outside for the parade. I also escorted one Vietnam vet to the reading of the names of fallen comrades. A parade, 21 gun salute and the laying of the wreath--very moving. And then two fighter jets did a fly-by. It's so easy to forget what our freedom costs. For today, let's all remember. Enjoy this beautiful day! In God We Trust. Over the past several days, I have been so pleased to see projects finished or the tops done from several classes. Here are a few pictures. 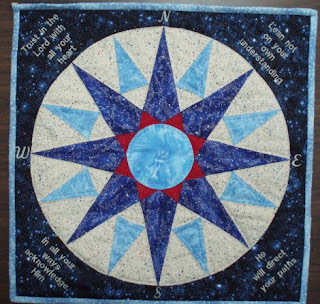 First is a completely hand-pieced Mariner's Compass done by Sue S. She machine embroidered Bible verses in the four corners, as well as the compass points. It is absolutely amazing! Well done, Sue! Next is the Monthly Bliss 2 hand-piecing sampler done by Lori M. She had a black, white and red quilt for MB1 and decided she wanted more color last year. It is beautiful--always remember that the poor photos are strictly my fault. It was wonderful to see you and your wonderful quilt, Lori! I have been busy with lots of classes the last few weeks. And scheduling even more for the summer months. I will be updating my website in the next few days to reflect those changes. Another author you should read is Sandra Dallas--she has not written a single book I haven't loved. Here are a couple nature photos for your amusement. 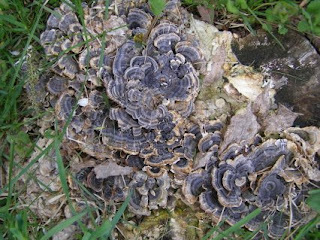 First is photo of fungus growing from a tree stump. It is so intricate! 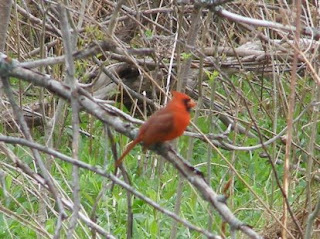 And there is a pair of cardinals who have been visiting me -- or rather the trees in my backyard. What a treat to see the vibrant red! I have columbine in blossom, bleeding heart, narcissus, lily of the valley and lilacs. The air is redolent with scent of the lilacs, especially when the weather is a bit warmer (we are expecting frost again tonight). Remember how special you are and spread some joy around. Just a quick post tonight--with a few new books that should be on your "Must Read" list. The Guild in the Granary by Alma Lynn Thompson (McDiggs Publishing). A mystery that you cannot put down. Anything by Earlene Fowler; she's probably my most favorite author, especially with the Benni Harper Mystery Series, which is quilt-based. If you haven't tried audio books yet, give them a try. It took me a while to get used to "just listening", but audio books are great in the car or while you are doing some unexciting stuff. I listen to a lot of things I might not take time to read in print. It is almost like a vacation for your mind because it concentrates on the spoken word, not the 5 billion other things you are usually thinking about! Are you remembering to smile? In these tough times, a smile from anyone is welcome. And, I'm passing this along for your consideration: On the back of our envelopes let's write "In God We Trust". It seems that the government wants to take that phrase off our money. As most of America is Christian based (at least the last I knew), let's stand up and be counted. It costs nothing, but lets people know where we stand. Can you believe it?!?!?! I actually did get posts up three days in a row! Stay safe and keep quilting! On April 21 I drove to Monaca, Pennsylvania, to teach and lecture at the Beaver Valley Piecemakers Quilt Guild. I had been there many years ago (we think it was at least 8 years ago!) and it was good to see so many familiar faces. On Wednesday, I taught over 20 women how to applique my Lily of the Valley block--it was great fun and they learned to make 1/8 inch stems, appli-pieced leaves and so much more. 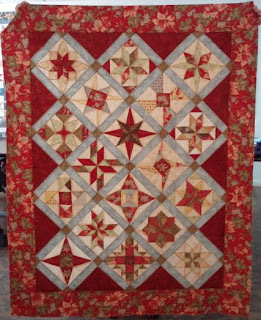 That night I did my "Hot Stuff" trunk show, which features chile pepper quilts and lots of other quilts both pieced and appliqued. It was good to see Maxine, the lady I stayed with on my previous trips. She is just delightful! On my way out of the church after the trunk show, I had a chance to walk to this small park in Beaver. 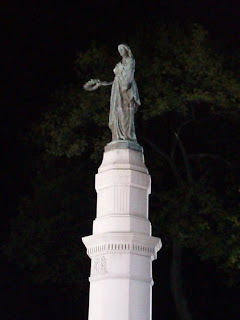 The statue was very beautiful--the pictures do not do it justice. There are always so many cool things to do and see in any area, but I'm working--so night pictures are what you get from this trip! 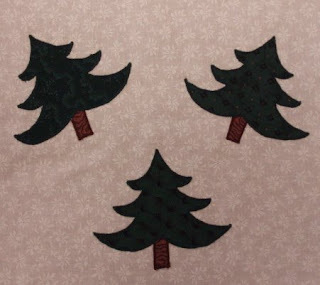 On Thursday, Hand Quilting Sharon's Way was the order of the day and over 22 women learned to quilt without poking their underneath finger and with no hoop or frame. No it is not stab stitch! As a former student said: "It changed my life!" She and another student had both won awards on quilts they had hand quilted with my method! You can't ask for anything better than that! It was a wonderful trip. Thanks, Linda, for booking me, and many thanks to all who made the trip such a success. Til tomorrow--when more astounding things will be forthcoming to amuse and/or bemuse you, dear readers. Yesterday I finally got my Lenovo N500 Notebook and access to the internet! It has been a long time without internet and email at home--I was surprised at how much I missed searching the web for information and checking email several times a day! I'm also glad that I did not get the 14 inch screen--mine is 15.4--because after so many years with a full-size keyboard I don't know how my hands would have fit on a smaller one than this! It will definitely take some getting used to, but it's been less than 24 hours and I am learning as I go! Now for the business--monkey business, that is! 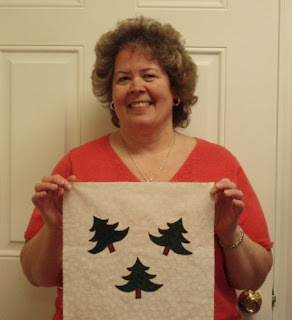 Here is a picture of Sue R. who was the lucky winner of one of my blocks. She chose a machine appliqued block that I did around 1990 as her prize. She said it reminded her of Christmas and was delighted with it. Here's a close-up of the block. The background was oversized, so Sue will be able to size it to suit her project. And I have one less UFO in the count! The phoebes are nesting in my old shed again. They love to sit on the glider and then swoop into the tree. Here's a pic of one of them. 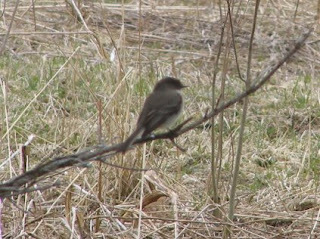 They are one of my all-time favorite birds. Additions to the "Must Read" files: "Home Safe" by Elizabeth Berg; "Knit Two" by Kate Jacobs (Author of "The Friday Night Knitting Club" and "Comfort Food", both excellent), "Act Like a Lady; Think Like a Man" by Steve Harvey. That should keep you busy for a bit. Here's a question for you--you know the commercials for "male enhancement" products that show two people, each in a bathtub facing the ocean? What is the point of two bathtubs? Wouldn't it be more fun to use one? Where does the water come from? Is there hot water? I can't imagine cold water being conducive to much of anything romantic. And why the bathtubs when you could be in the ocean? I realize I've missed the whole point somewhere--but what was the point!!!!!! And this is not a rhetorical question--please leave me a comment if you know! I have lots of travel news and pictures. But I think I'll close for now and then post again tomorrow night. Yes, that's right--two days in a row. Stay tuned to see if I can stretch it to three! Good night, blog readers, wherever you are!